Scott Brownell will be following up on the December 2018 DPS presentation and will be giving updates to wrap up the academic year. If you miss the presentation from December you can see the event recap here. Join us to hear goals, updates, and plans moving forward from the University Council subcommittees whom we didn’t hear from this Fall. This is the second of this year’s two part series to help allow more time for questions. 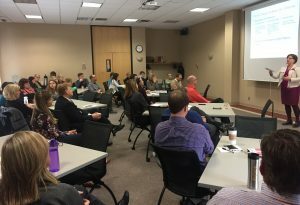 Half of the sub-committees presented this fall (read our event recap). We look forward to seeing you there! Thank you for those who were able to attend. If you missed the presentation you can watch the live recording, linked here. E2Campus Alert—Take time to check that your signed up for alerts and manage you subscription. It will expire after a few years. The Augsburg University Staff Senate shall serve Augsburg University and its staff by providing a forum to foster and promote a positive and meaningful dialogue among staff, faculty, students and administration by advising in decision making processes, by serving as an advocate for staff, by promoting professional development opportunities, and by recognition of staff’s contributions to furthering and upholding the mission and values of Augsburg University. Learn more about Staff Senate. Could parking lots be better named (currently not intuitive or memorable)? Could exterior signage be added to indicate which entrances / spaces are accessible? Rebecca reported that office moves can be both tricky and costly. The Space and Use Planning Committee helps propose and estimate budget for a prioritized set of moves each fiscal year. Jeff Swenson and Jim Trelstad-Porter reiterated that UC is not a governance body, but rather a deliberative body that meets to critically evaluate a broader range of viewpoints to provide President Pribbenow with advice on decision making and priority setting. The council’s effectiveness is gauged by improvements in internal communication and information sharing, and whether the campus community feels it is a safe space for idea sharing across departments and programs. Provide review and oversight to changes to Student Learning Outcomes. Leif shared a definition of a Community of Practice. The Forum is focused on deliberation, co-learning, and relationship building. The Forum uses a “flipped classroom” format, aligned with the Focus Conversation series. The Leadership Forum deliberated as a group and took part in a structured conversation around the “Engage – Aspire – Grow” framework for the Augsburg2025 Strategic Plan. Outcomes included thoughtful consideration of terms such as “democratic purpose” and “public calling”; and requests to more closely examine issues surrounding affordability, growth, and sustainability. This year Staff Senate has decided to host two forums to help allow more time for questions. Half of the sub-committees will present at this first session and the others will join us in the spring for a second forum. We look forward to seeing you there! The Staff Senate and University Council (UC)—Subcommittee Forum was well received by those in attendance. To start the forum Staff Senate members, Green Bouzard and Pa Dao Yang gave a brief overview of what Staff Senate is, the mission, the members, the 2016-17 goals, and announcements of upcoming opportunities. This information can be found at inside.augsburg.edu/staffsenate. Following the introduction of Staff Senate each University Council subcommittee had a representative explain what their roll is, give updates on the work they have done, and what current goals they are working on. Below is a recap of what we learned. Jim spoke about the interplay between the University Council (UC) and its various subcommittees. The UC is a non-governing body that provides consultation to the President. Jim (elected by staff ) and Jeff Swenson (appointed by Staff Senate) represent all staff and work to protect staff interests in this group. The UC convenes to consider specific ideas proposed by subcommittees (e.g. Smoking policy; NCAA transgender policy), engaging in broad deliberation on key issues still taking shape in order to reach consensus. The group is working to create a baseline of content/input to be more effective. This subcommittee is comprised mostly of staff and uses the student inclusion assessment to guide work and planning. The committee’s strategic plan and minutes can be found on its Moodle site. In general, this group is working to continue to enhance a campus-wide conversation on what intentional diversity and inclusion mean on our campus. Conversations are underway to address student concerns regarding diversity across the curriculum and to increase representation on faculty by people from historically marginalized. Augsburg’s faculty hiring process is scheduled to be externally reviewed in December. The reviewer will present back in a Focused Conversation in early 2018. The committee is also working with student government to review concerns of accessibility across campus. Supporting this committee is the Campus Climate Advisory Team, which convenes when necessary to respond to local, regional, and national issues that affect our students. Leif shared that Leadership Forum is a “community of practice” for leaders on campus to gather to improve their practice as leaders. The Forum advances Augsburg’s mission through careful deliberation with peers and improving leadership skills by building relationships across campus. Group consists of VPs, their direct reports, and directors of administrative units. The group convenes twice monthly to consider topics from Focus Conversations, asking “What are the leadership questions we need to be asking?” in order to support a variety of stated strategic initiatives. The Resources subcommittee provides guidance to the President and UC on how best to allocate our available resources in order to meet the goals of our strategic plan and mission. The committee asks “How can space foster collaborations and intersections” and uses stakeholder feedback to influence priority-making during budget season. The Environmental Stewardship Committee is working on implementing the Climate Action Plan, a presidential commitment first established in 2009 and is beginning to implement a sustainability work plan with $475,000 in support from Margaret A. Cargill Philanthropies. Scholarship & Curriculum – Institutional Learning Outcomes that highlight student learning around the theme of sustainability, including health and wellness. Recap on Fall 2017-18 – Grad admissions were very strong, exceeded goal in all but one graduate program. Undergrad took a slight dip below our goal after 10-day. However, the cohort had higher ACT and GPA scores. Nate predicts this will result stronger retention and 4-year grad. Other key decisions are being held until the appointment of a new VP for Enrollment. Look for a Focused Conversation on Strategic Facilities Management on March 6, 2 p.m., OGC 100 and March 7, 12:30 p.m., OGC 100. The Staff Senate and UC—Subcommittee Forum was well received by those in attendance. To start the forum Co-chair Jen Jacobs gave a brief overview of what Staff Senate is, the mission, the members, and the 2016-17 goals. This information can be found at inside.augsburg.edu/staffsenate. To start the University Council presentations Leif Anderson gave an overview of the UC Council and the subcommittees. To follow a representative from each subcommittee shared the goals and 2015-16 accomplishments of their subcommittee. Each subcommittee was in attendance; Campus Design and Space Use, Diversity and Inclusion, Enrollment, Environmental Stewardship, Resource, and Student Success. It was interesting to see the progress being made under this new University Council structure. Although the forum didn’t leave too much time for discussion some subcommittee representatives left with questions for their initiatives. If you have questions or concerns you can learn more about each committee along with whom to contact at inside.augsburg.edu/universitycouncil. A goal of Staff Senate’s this year is to increase communication. If you have any feedback on how we can improve the Staff Senate and UC—Subcommittee Forum please email us at staffsenate@augsburg.edu. Thank you for everyone who was able to attend and to those who presented. Based on feedback Staff Senate received seeking more communication, Staff Senate will be hosting a forum to give a overview of the role of staff senate and hosting representatives from each of the UC-subcommittees to uplift some of the amazing work going on in each committee. We invite you to join us for this great opportunity to learn what our rock star colleagues are doing for Augsburg college! The Staff Senate open forum on Wednesday, October 23 will focus on the Augsburg College Campus Cupboard and how to support this critical program. Starting at 1 p.m., Lynn Ellingson and Brian Noy will discuss the program, current needs among Augsburg students, and how Augsburg staff and employees can support Campus Cupboard. Visit the Campus Cupboard webpage for more program information. Note that this open forum time has been changed from the normal time. Augsburg College Staff Senate would like to invite you to its first Open Forum of the academic year 2013-14. The Senate hosts its open forum on the fourth Tuesday of each month. All are welcome to attend. This month Justin Lind-Ayres, associate college pastor, will be available for discussion and questions. Please plan on attending this special opportunity to learn more about Justin and the work in Campus Ministry. If you have questions about the event, please email staffsenate@augsburg.edu.